ESRB rates Punch Out!! for Wii, description sounds like ... Punch Out!! ESRB has given Punch Out!! for the Wii an "Everyone 10+" rating, for "comic mischief" and "cartoon violence." The description doesn't reveal much about the game we didn't know, but it does make it sound a hell of a lot like the Punch Out!! we've all come to know and love. And that's a good thing. "This is a boxing game in which players compete in boxing matches against a cast of colorful, fictional characters. While players can use standard boxing moves (jabs, hooks, uppercuts), most fights are performed in a comical fashion with an assortment of "dizzy stars," "cartoony" sound effects, and slapstick signature moves (e.g., growling, dropping shorts, conking oneself on the head, twirling, etc.). 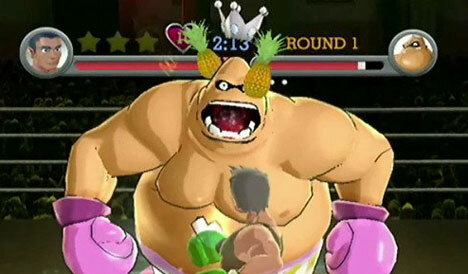 Boxers' faces show lumps and bruises after taking damage, and some knockouts are depicted in slow motion as players are sent flying across the canvass. One character flexes his pectoral and glute muscles prior to a fight, while another boxer belches during a cutscene." A new Punch Out!! is something I've been dying to see for a while; the lack of an Nintendo 64, Game Boy Advance, or GameCube game still keeps me up at night. So I have high hopes for this game, hopes of "if it ain't broke, don't fix it." My biggest concern here is how Nintendo will handle the game mechanics, praying that we're not subjected to motion controls simply for the sake of having motion controls. I don't have a problem with turning my Wii Remote sideways and using it like a classic controller, Nintendo. I'm sure I'm not the only one.